Its sharp taste and pungent flavour make it an all-time favourite cooking oil. At the same time, its vitamin-laden, anti-bacterial and anti-oxidant properties are acknowledged widely. With so many brands of mustard oil in the marketplace, consumers may often be faced with confusion about choosing one over the other. The question is: are they all as good as another and do they meet the basic requirements? Do they all fulfil the minimum requirements and are they all safe for consumption? Do we know that the acid value in mustard oil indicates the age of the oil? How many of us know that the oil must not have any traces of argemone oil or mineral oil? Cold-pressed mustard oil, better know as kachchi ghani oil, should also be free from the solvent hexane. 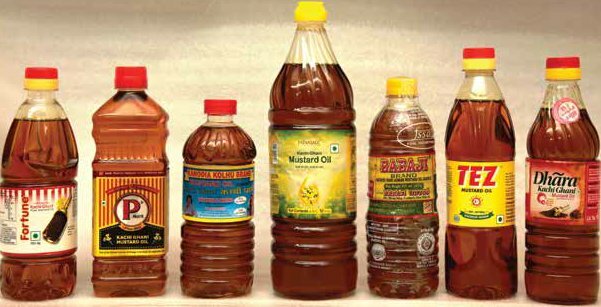 This report checks seven popular brands of mustard oil along the above-mentioned parameters, which are important determinants of quality and safety. It may be noted that only three of the seven brands – namely Babaji, Kanodia and P Mark – were AGMARK-certified. The good news is that none of the tested brands diverged from the Food Safety and Standards (FSS) Regulations on the key parameters, as discussed in detail below. Mustard oil is rich in monounsaturated and polyunsaturated fats, which may help to balance cholesterol levels in the body. When consumed, mustard oil may fight bacterial infections inside the colon, intestines, urinary tract and other parts of the digestive system. Applied directly to the skin, mustard oil can help fight fungal infections. Mustard oil boosts the appetite and aids in digestion by stimulating the secretion of gastric juices and bile as well as stimulating the excretion system. Some research suggests that mustard oil may have positive effects on patients suffering from sinusitis. It may also help soothe the effects of coughs, colds and other respiratory illnesses and irritants. Mustard oil deters insects and may be an effective mosquito repellent, which can be useful in preventing malaria and other disease carried by the insect. 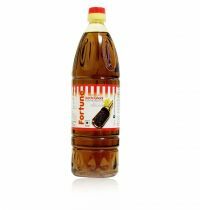 Applied topically, mustard oil has been known to relieve the painful effects of rheumatism and arthritis as well as help soothe sprained ankles and other such joint aches and pains. Blending oils is another option, whereby you take equal proportions of different oils in one container and then use it. This way you do not get prolonged exposure to the side effects of one type of oil and also get the benefits of different oils. You could also have two or more different kinds of oils in your kitchen which you could use for different purposes. For example, you could use olive oil for salads, groundnut oil for frying, and mustard/soybean oil for other cooking purposes. You can see list of our CV Surveillance Series- Mustard Oil (Kachchi Ghani) below, perform Side-by-Side comparison. If you need further help, do have a look at Conzumr Guides and Tips. Alternatively you can view all Mustard Oil (Kachchi Ghani) to choose your own favourites. Mustard oil (sarson ka tel) means the oil expressed from clean and sound mustard seeds, belonging to the campestris, juncea or napus varieties of Brassica. It shall be free from rancidity, suspended or foreign matter, separated water, added colouring or flavouring substances, or mineral oil. Kachchi ghani refers to the ‘cold press’ extraction process of mustard oil. Mustard seeds are crushed at low temperature so that natural properties, antioxidants and essential oils are retained in the oil. The essential oils content of kachchi ghani mustard oil also acts as a preservative and exhibits anti-bacterial and anti-carcinogenic activity. Mother Dairy Fruit & Vegetable Pvt. Ltd. Mustard Oil (Kachchi Ghani) : Mother Dairy Fruit & Vegetable Pvt. Ltd.
Adani Wilmar Ltd. Mustard Oil (Kachchi Ghani) : Adani Wilmar Ltd.
Patanjali Ayurved Ltd. Mustard Oil (Kachchi Ghani) : Patanjali Ayurved Ltd.
Puri Oil Mills Ltd. Mustard Oil (Kachchi Ghani) : Puri Oil Mills Ltd.
Recon Oil Industries Pvt. Ltd. Mustard Oil (Kachchi Ghani) : Recon Oil Industries Pvt. Ltd.
Free from added colouring substances. Mustard oil : Free from added colouring substances. Free from added colouring substances. Mustard Oil (Kachchi Ghani) : Free from added colouring substances. Packed in PET plastic bottle. Mustard oil : Packed in PET plastic bottle. Packed in PET plastic bottle. Mustard Oil (Kachchi Ghani) : Packed in PET plastic bottle.